Copyright © 1983-2006 by J. M. Auricchio, Jr. 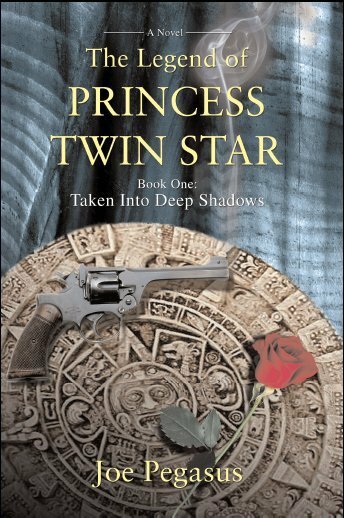 The first book of The Legend of Princess Twin Star about a rag-tag team of detectives caught up in the prophecies of the Mayan end of the world in 2012, when they are dragged into a kidnapping. Taken Into Deep Shadows tells the fast-paced story of a young mother who struggles to solve the mystery of her son's kidnapping. Inca is resurrected! A king whose weapon is cocaine, whose resource is the lost Inca gold, enters the modern day world and the lives of seemingly ordinary people. A princess who carries a tattoo around her neck that reveals the secrets to mankind's survival through the horrors predicted for a doomsday scenario. The girl is kidnapped, to be sold into child slavery and her secrets are stolen. Far away, the son of a drug runner is also kidnapped. Elsewhere a strange Monsignor buying up snatched children brings the boy and princess together. In New York City a power hungry mobster who can read the future gains control over the key to mankind's future. A dangerous drug dealer on Long Island enslaves the kidnapped boy's mother. All this unfolds with a DEA agent hot on their heels! Add to the mix a ragtag police narcotic squad and the race is on to recover the kidnapped children and the key to mankind's survival hidden beneath the princess' lacy blouse. Alchemy and Mesoamerican intrigue blend in this first of a series of three books. Taken into Deep Shadows introduces the characters and their roles in leading a stumbling and misguided world toward the cosmogenesis prophesied for December 21, 2012. Watch for Book 2 - Condors Over Manhattan.